The story from The Guardian in 1978 covering Pollard’s no-hitter. 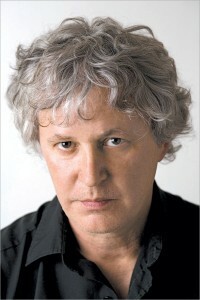 Robert Pollard, the leader of the Dayton-based indie rock band Guided by Voices, threw a no-hitter as a pitcher on the Wright State baseball team in May 1978. It was the first no-hitter in the baseball program’s history. 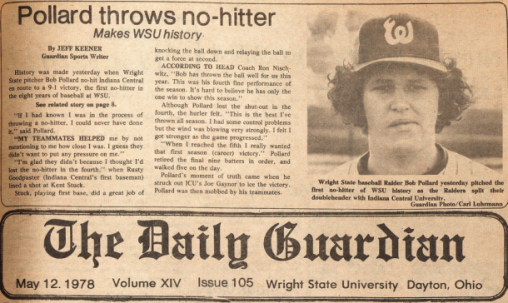 Pollard’s accomplishment resurfaced this week when Wright State digitization specialist Ryan O’Grady, who was in the process of digitizing The Guardian, the university’s student newspaper, came across a front-page article about the no-hitter. A fan of Guided by Voices, O’Grady emailed the photo to a friend, who is also friends with the band. The photo found its way onto Hardball Talk, and was then shared across Twitter and other social media platforms within minutes. O’Grady and the rest of the Digital Services team at the Paul Laurence Dunbar Library are excited about the attention the photo has received on campus and beyond. The Guardian collection in CORE Scholar is currently compose of 126 historic issues and is available in the University Libraries’ online institutional repository, with another 83 issues to be added soon. Pollard received a B.S.Ed. in integrated business education from Wright State in 1979.